Make plans to attend the Ohio River Valley Woodland & Wildlife Workshop on Saturday, March 30, 2019. This one-day workshop will be held at Clifty Falls State Park between Louisville and Cincinnati in Madison, Indiana. It is directly across the river from northern Kentucky (Trimble County). Lodging is available at the park. Forestry and wildlife experts from Indiana, Kentucky and Ohio will address the questions and concerns woodland owners have regarding the management of their properties. The next KWOA/F quarterly board meeting will start at 10:30A (EST) on February 14 at the Kentucky Forest Industries Association’s office on 106 Progress Drive in Frankfort. Lunch will be provided for a small fee. Members are encouraged to attend. From the Woods Kentucky is a weekly radio show broadcast by the University of Kentucky Department of Forestry and Natural Resources on WRFL 88.1 FM Lexington. The show airs spring semester 2019 on Mondays from 11 am until noon on 88.1 FM in Lexington. Recordings of From the Woods Kentucky are archived for listening at your convenience. Prior topics include firewood, woodlands owners, deer, watersheds, citizen science and many more. The guide highlights many great examples of work all across Kentucky to address climate impacts and steps you can take. See additional resources on the Kentucky Conservation Committee’s new Climate Action web pages. 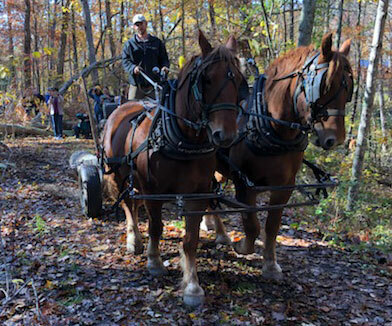 The University of Kentucky Forestry and Natural Resources Cooperative Extension team recently won the Comprehensive Family Forests Education Award presented by the National Woodland Owners Association and the National Association of University Forest Resources Programs. This is the second time the team has won this national award, which is presented to an educational institution that has delivered the most effective education program benefiting family forest owners over the past five years. A family forest education program is a combination of educational materials, media, courses, workshops, events and/or electronic media, including applied research that supports those efforts. The award recognizes effective programs that address any or all aspects of forest resources management including silviculture, forest health, harvesting, forest and estate planning, business management and marketing. Jeff Stringer, chair of the Department of Forestry and Natural Resources in the UK College of Agriculture, Food and Environment, accepted the award on the team’s behalf. Information about the programs and resources UK Cooperative Extension offers for Kentucky woodland owners is available online at forestry.ca.uky.edu/extension-home. UK Forestry Extension is partnering with some of our sister Forestry Extension programs in nearby states such as Missouri, Tennessee, Virginia, North Carolina, and South Carolina to offer a webinar series targeting “beginning woodland owners”; however, there is sure to be something for even the most seasoned woodland owner as well. The series will feature forestry and wildlife experts from around the region. So far, 34 County Extension Offices have signed on to host one or more of the webinars. Click here < http://forestry.ca.uky.edu/webinars_upcoming > to find the closest hosting counties and make plans to join us for this informative and educational series. The webinars will run from 7- 9P EST (6P – 8P CST). How has past land use shaped our forests? Why are your woodlands important? Learn what you need to know about management plans. Invasive plants, insects (native and exotic), diseases (native and exotic) and wildfire. Wildlife habitat requirements and enhancing habitat for game and non-game wildlife. Learn about the forestry and wildlife assistance available in Kentucky to help you care for and get the most from your woodlands. UK Forestry Extension. 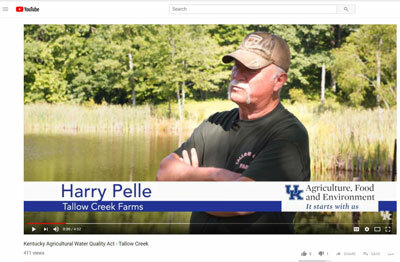 Check out this great video highlighting forestry and the Kentucky Agricultural Water Quality Act which features Kentucky Master Woodland Steward and Kentucky Woodland Owners Association Board Member Harry Pelle and his wife Karen. Learn how the Pelle’s have implemented numerous conservation practices that benefit their woodlands and help to enhance water quality in Kentucky. To learn more about the Kentucky Agricultural Water Quality Act and how to make your own ag water quality plan, please click here. UK Forestry Extension. Woodland owners in Central and Northeast Kentucky have a new opportunity to receive woodland management plans through a recently awarded Regional Conservation Partnership Program project entitled “Increasing Farm Bill Participation and Benefits”. The project’s primary goal is to service a backlog of requests for woodland management plans in KDF’s Central and Northeast regions. The University of Kentucky Department of Forestry and the Kentucky Division of Forestry developed and were awarded this USDA Natural Resources Conservation Service (NRCS) project that utilizes financial assistance through the Environmental Quality Incentives Program (EQIP) to develop new woodland management plans for Kentucky landowners. If you have been waiting to have a woodland management plan developed and your property is in the project area, please visit your local NRCS office and let them know you want to participate in the UK Forestry-RCPP program. Got questions or need more information? Please email or call Billy Thomas at billy.thomas@uky.edu or call 859.257.9153. UK Forestry Extension. Tom Grissom, a Kentucky Master Woodland Steward, is partnering with the Berry Center and Sterling College to offer a forestry field day on his farm highlighting low impact logging tactics and techniques. FIELD DAY: Drennon Woods farm, 723 Barton Lane (off the Pt. Pleasant Rd. ), Pleasureville, KY, 40057. Instructional program will include restorative forestry practices harvesting red cedars in order to regenerate and thin mixed uneven-aged hardwoods on abandoned subsistence farm lands. Saturday, Feb. 2, 10 a.m. to noon. FRANKFORT, KY. — Know a Kentucky farmer or forester who goes above and beyond in the care and management of natural resources? Nominate them for the 2019 Kentucky Leopold Conservation Award®. Sand County Foundation, the nation’s leading voice for conservation of private land, presents the Leopold Conservation Award to private landowners in 14 states for extraordinary achievement in voluntary conservation. In Kentucky, the $10,000 award is presented with the Kentucky Agricultural Council and the Kentucky Association of Conservation Districts. Given in honor of renowned conservationist Aldo Leopold, the award recognizes landowners who inspire others with their dedication to land, water and wildlife habitat management on private, working land. In his influential 1949 book, “A Sand County Almanac,” Leopold called for an ethical relationship between people and the land they own and manage. The application deadline date is April 1, 2019. The committee prefers application materials to be sent electronically. To do so, please e-mail materials to colemansteve51@gmail.com. The 2018 recipient of the award was Trunnell Family Farm from Utica. The Kentucky Leopold Conservation Award is made possible thanks to the generous support and partnership of Kentucky Agricultural Council, Kentucky Association of Conservation Districts, Kentucky Farm Bureau Federation, Kentucky Department of Agriculture, Kentucky Corn Growers Association, Kentucky Department of Fish and Wildlife Resources, University of Kentucky College of Agriculture, Food and Environment, Kentucky Woodland Owner’s Association, Kentucky Tree Farm Committee, Kentucky Cattlemen’s Association, AgriBusiness Association of Kentucky, Kentucky Pork Producers, The Nature Conservancy in Kentucky, and the U.S Department of Agriculture’s Natural Resources Conservation Service. The Leopold Conservation Award is a competitive award that recognizes landowner achievement in voluntary conservation. The award consists of $10,000 and a crystal depicting Aldo Leopold. Sand County Foundation presents Leopold Conservation Awards in California, Colorado, Kansas, Kentucky, Missouri, Nebraska, North Dakota, Oklahoma, Pennsylvania, South Dakota, Texas, Utah, Wisconsin and Wyoming. Sand County Foundation inspires and enables a growing number of private landowners to ethically manage natural resources in their care, so future generations have clean and abundant water, healthy soil to support agriculture and forestry, plentiful habitat for wildlife and opportunities for outdoor recreation. The Kentucky Agricultural Council is a 501(c)(3) organization consisting of some 80 agricultural organizations representing all sectors of Kentucky agriculture. The membership is composed of commodity groups, state and federal agricultural organizations, agricultural trade organizations and the state’s institutions of higher education that serve Kentucky agriculture. The KAC functions as an umbrella group and hub for its members, disseminating information and promoting coordination among all agricultural organizations and sectors. Since 2006, the KAC also has served as the “steward of strategic planning” for the future of Kentucky agriculture and Kentucky’s rural communities. www.kyagcouncil.net. The Kentucky Association of Conservation Districts is 501(c)(3) organization consisting of Kentucky’s local conservation districts and watershed conservancy districts. KACD encourages the exchange of information relating to the administration and operation of conservation districts and watershed conservancy districts; to affect cooperation between districts and agencies and organizations concerned with any and all phases of soil and water conservation; to promote the welfare of conservation districts and watershed conservancy districts and the people therein; and to maintain strong and active membership in both KACD and the National Association of Conservation Districts.